Description: Swing Journal Gold Disc! A brand-new recording released on superior-sounding HQCD! Another debut CD of a talented female vocalist released by Venus records! 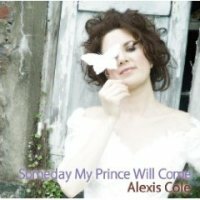 Alexis Cole, born into a musical family in New York and raised in Miami, began her professional career after obtaining a master's degree from the Aaron Copland School of Music at Queens College. She has performed with Slide Hampton, Rufus Reid and Harry Pickens among others, and so far released four CDs on independent labels. With a voice praised as a deep contralto as smooth and dark as the richest espresso (Jazz Times, November 2007,) Cole tackles a very special set of Disney tunes on this stunning CD. It is not an easy thing for a jazz singer to do, considering such classic Disney-meets-jazz albums as Satchmo Sings Disney and Dave Digs Disney, but Cole pulls it off beautifully. The success of this album is due to several factors. First, Cole chose the songs wisely, avoiding obvious choices (except for the obligatory title track and "When You Wish Upon A Star") and digging deep into the Disney's catalog of films and TV programs. Second, she was surrounded by New York's first call musicians including Fred Hersch, Matt Wilson and Don Braden. Harmonica player Gregoire Maret appears on severl tunes and adds unique sonic textures. Lastly but not least, Cole's singing is phenomenal! Her voice is rich and strong. She has impeccable technique and control, and a confident jazz style that hints an influence from Carmen McRae. Recommended! The vinyl LP version of this album is available here. Produced by Tetsuo Hara and Todd Barkan. Recorded at Avatar Studio in New York on May 9 & 10, 2009. Engineered by Katherine Miller. Mixed and mastered by Tetsuo Hara. HQCD (High Quality CD) is a new CD formulation that offers superior sound quality. It is compatible with all regular CD players.